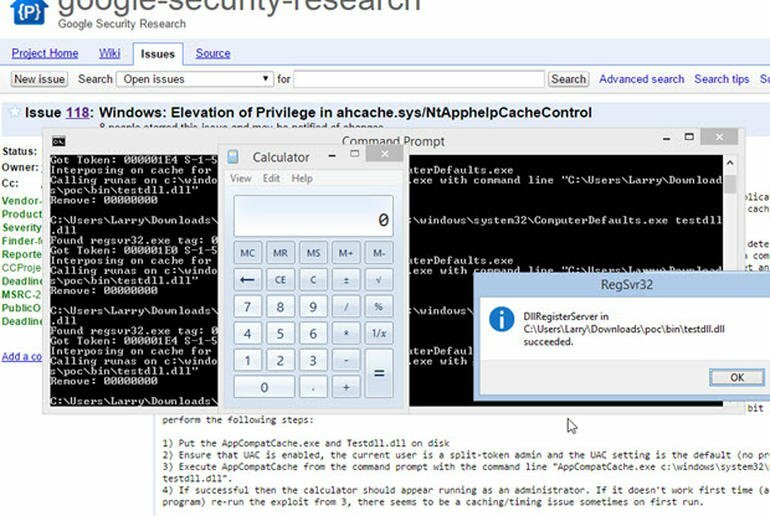 Dziury w Windows 8.1 – backdoor – jak podaje google-security-research mamy doczynienia z podniesieniem/zamiana uprawnień w ahcache.sys / NtApphelpCacheControl. quick reuse when new processes are created. entries as the operation is restricted to administrators. This is checked in the function AhcVerifyAdminContext. of the caller to determine if the user is an administrator. system process and bypass this check. to get the impersonation token but there are probably other ways. It is just then a case of finding a way to exploit the vulnerability. which forces a RedirectExe shim to reload regsvr32.exe. a suitable pre-existing app compat configuration to abuse. (although it looks like depending on the flags this might be bypassable). No effort has been made to verify it on Windows 7.
auto elevation for demonstration purposes. The PoC has been tested on Windows 8.1 update, both 32 bit and 64 bit versions. I'd recommend running on 32 bit just to be sure. and the UAC setting is the default (no prompt for specific executables). 4) If successful then the calculator should appear running as an administrator. there seems to be a caching/timing issue sometimes on first run. Lukę do poprawienia ma funkcja "AhcVerifyAdminContext"
Do tej informacji dołączono exploit "PoC". na skutek błędu w ahcache.sys/NtApphelpCacheControl. Skrypt uruchamiamy klikając (domyślnie) 2 razy w ten sposób utworzyły się dodatkowe kafelki które można przypiąć do paska zadań Windows 8. Aktualizacja z błędem w Windows 8 i Windows 8.1 która uniemożliwia wprowadzanie polskich znaków to Synaptics-Pointing Device. Po odinstalowaniu tej aktualizacji mamy ponownie polskie znaki.